In the past weeks I had quite a lot of ongoing discussion with people having trouble setting up TMC2130 drivers they ordered from China. As I own the watterott ones for quite a time now I inspected the Chinese ones to find a few issues to get them to work proberly. A) watterott TMC2130 come with the SPI bridge open so are ready to go in SPI mode. Most Chinese ones have the SPI bridge either closed with a solder pont or a SMD resistor. If the driver operates in SPI Step/DIR mode the CFG4->GND disables dcStep backfeed. This is vital to be able to use stallguard and sensorless homing. As if CFG4 left open as on the Chinese would require an external driver module to handle the stallguard2 and won't operate correctly with the Marlin included TMC2130Stepper library. 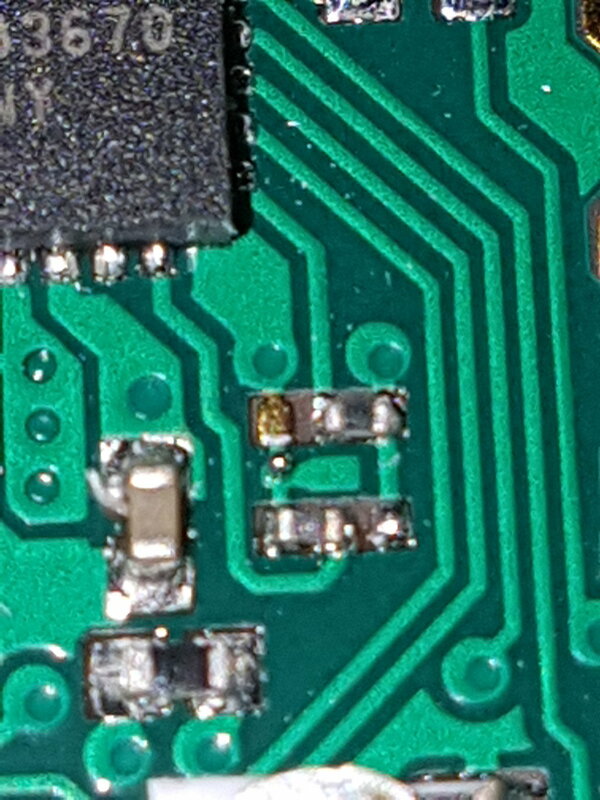 My FYSETC had a 0 ohm resistor in the spi bridge. I’ve removed it and used a blob of solder to bridge CFG4 and it works as it should. However, the other thing that I think will be a problem is that there is silkscreen over the top of the thermal vias under where the heat sink should go. This will significantly reduce cooling performance; I’m going to have to carefully scratch it off. 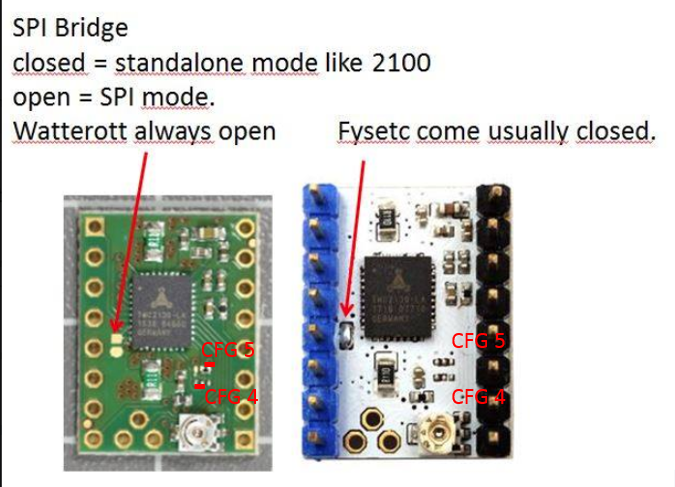 The difficulty of these mods (the CFG4 bridge is quite hard, it’s tiny) plus the cooling issue means I really do not think the FYSETC ones are good value; buy the genuine Watterott ones!! Same goes for the Fysetc TMC2100. Even worse are all MKS drivers with TMC Chip. 1. the vref only goes from 0.0-0.2 on mine. what the heck? Didn't change pins or anything. Anyone have these issues? ah nevermind, just had to pop the pins underneath. all is good. @oakdesign - jsut to be sure - will the Fysetc TMC2208 stepstick work out of the box in UART mode, if I just pull the PDN pin up and connect my microcontroller to this pin? - Or is additional soldering required on one of the jumper/solderpads on the stepstick ?